What’s Your Plan When Something Spills (and does your team know)? Whether we like it or not, chemical spills are an expected part of operations at many factories, plants, and facilities across the country. The way spills are dealt with are unique to these locations and the materials they store. Despite their differences, all these facilities have one thing in common: the need for a firmly established plan to follow when responding to a spill. There are two types of spills that OSHA differentiates: incidental and emergency. A spill is classified as incidental when there is a release of a hazardous substance that does not pose an immediate threat to employees; the extent of it is deemed manageable through an examination of the quantity, environment, and properties of the substance spilled; and can be managed by properly trained employees wearing appropriate PPE. A spill that requires emergency response poses an emergency through variable factors, such as potential of high exposure to toxic substances, it threatens life safety, causes evacuation, presents a fire or explosion hazard, or overall is potentially harmful to workers. Emergencies require a fully articulated plan with certified responders ready to take action. Any minor or ordinary spill that does not require immediate attention and can be safely handled by employees is incidental (OSHA 1990). There's a Spill: What's Your Plan? When a spill occurs, there are two basic things you need to have already formulated: knowledge of the chemicals in your facility and a plan in place to deal with them if they do spill. Creating and maintaining your spill response plan is a vital part of your overall safety and health program. Firefighters don't put out fires without training, and the Patriots didn't make the Super Bowl without practice. Before a spill ever occurs, practice your spill response plan by using your spill kits and going through the following procedures. Hands-on experience is not only more engaging than reading off a list of rules, it also gives your employees experience necessary to complete the plan when the occasion arises. When it comes to emergency spills, depending on the materials involved and the type of facility you operate, you may be required to have certified responders in place and a well-documented regular training schedule conducted by certified trainers. Make sure you’re up to date on how OSHA’s HAZWOPER standard applies to you. If you work with oil or oil-based products, you’ll definitely need to be familiar with the EPA’s SPCC regulations too. Information and training on any hazardous chemicals that are in their work area when they first begin work, and relative training when a new chemical is introduced. Methods to detect presence of a chemical. Hazards associated with the chemicals. How to protect themselves from the hazards, including the emergency response plan. How to read the labels on chemical storage containers (OSHA 2012). The first step when you know there is a spill is to clear the area and don't let anyone enter the contaminated zone. Use proper signage to notify of the spill and restrict any access points so the uninformed are notified if they happen across your area. During this initial stage, you should attempt to determine what substance was spilled if you do not already know. The easiest identification method is to examine the container label or Safety Data Sheet (SDS). Once you know this, you will have a better idea of the actions you will take for response. Gather information about the extent of the spill so you know the scope of what you are dealing with. Special considerations should be made for any dangers to the spill responders and the environment. Now that you know what you are dealing with, it's time to don the proper PPE for the job. 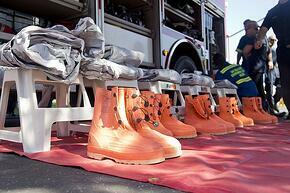 Many responders may already know what PPE they should wear to handle the spill. Or, some responders may have already been working with the chemical, and therefore will already be wearing the right PPE. To find out the right PPE to wear, read the SDS or accompanying literature for guidance. A well-prepared plan will identify the PPE needed during employee training. If uncertain which PPE is required, wear the highest level you have. Gloves, safety glasses, and aprons are standard for all spills; other PPE like a self-contained breathing apparatus is necessary when there is escalated risk depending on the chemical and situation. Select an incident commander who delegates different tasks to those on the response crew. This can be a predetermined individual who has the most experience and knowledge of the facility, hazards, and employees involved. The incident commander will lead the response team and make sure the response plan is followed. Now that the response team is wearing their PPE and knows the material they are responding to, you can now begin the containment process. This step should include stopping the source from continuing to spill and using sorbents to prevent further spread. A boom takes the shape of a cylinder, can vary in length, and controls spills by preventing further spread. Some booms rest on water to prevent spread, and they can be connected to others to contain large spills. 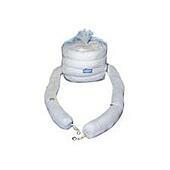 Sorbent socks are very similar to booms, although they are smaller and used for both clean-up and containment. Socks easily wrap around machine bases and leaky drums for leak protection. Pillows are filled with sorbent material and are great for cleaning up spills in hard to reach places, such as under a valve or machinery. 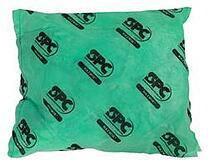 Many are designed for use with chemical and hazardous fluids and have high absorbency capacity. These come in different lengths and sizes and are an effective way to quickly soak up different substances. The different properties of what you buy will depend on what your location needs, and they can be chosen based on their absorbency and what they pick up. Loose sorbents, also known as granular sorbents, are perfect for smaller spills. 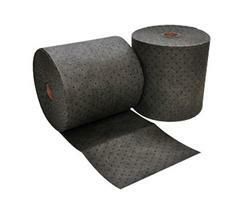 They're absorbent particles that are spread overtop a spill to rapidly clean it up. Decontaminate, store all chemicals, and clean your gear. Decontamination starts with removing all of the chemicals that spilled, contaminated sorbents, and anything else that may have been exposed (such as soil or other media). Properly dispose of any disposable PPE and clean off reusable PPE, like respirators, with the right cleaning materials. Depending on the type of spill, you may be legally obligated to report the spill. The federal government has different requirements for reporting an oil spill or a hazardous substance. Visit this link to determine whether or not a spill requires a report to the EPA. Regardless of whether you are required to report via phone, recordkeeping and direct access to records for employees are required by OSHA (OSHA 1997). After documenting and recording the incident, you now have the opportunity to examine the response, your preparedness, and what could be improved upon. This is an essential part of maintaining your safety and health program and continuing to grow your employees and company safety as a whole. You now have the foundation for an effective spill response plan. Keep in mind that every facility has a different plan depending on chemicals present and the floor layout, but they should all follow this general guideline. At ORR Safety, we strive to provide companies with top quality products and processes that enhance worker safety and operations. Contact us to learn how we can help you develop a safety program at your facility that ensures standards compliance and keeps the wellness of all your employees a top priority.